2010 March 19th-21st 2010 Exclusion and the Politics of Representation The three-day conference in Copenhagen posed the question of how psychoanalysis can be used to think about the invisible and subtle processes of power over symbolic representation, in the context of stereotyping and dehumanization. March 25th-27th 2011 Nationalism and the Body Politic The three-day conference in the Norwegian Psychoanalytic Society in Oslo focused on the recent revival of nationalist ideas, and posed the question of what fantasies these give voice to. July 31st-Aug. 7th 2011 Narrativities and Political Imaginaries The focus of this six-day conference in Falsterbo, Sweden, was the psychoanalytic interrogation of the political in terms of its narrativity and iconography. March 9th-11th 2012 Shared Traumas, Silent Loss, Public and Private Mourning The three-day symposium in the Swedish Psychoanalytical Association, Stockholm, questions the junctions of the private and the public when it comes to trauma, loss and the work of mourning, notions which challenge our very notions of the individual and the shared. 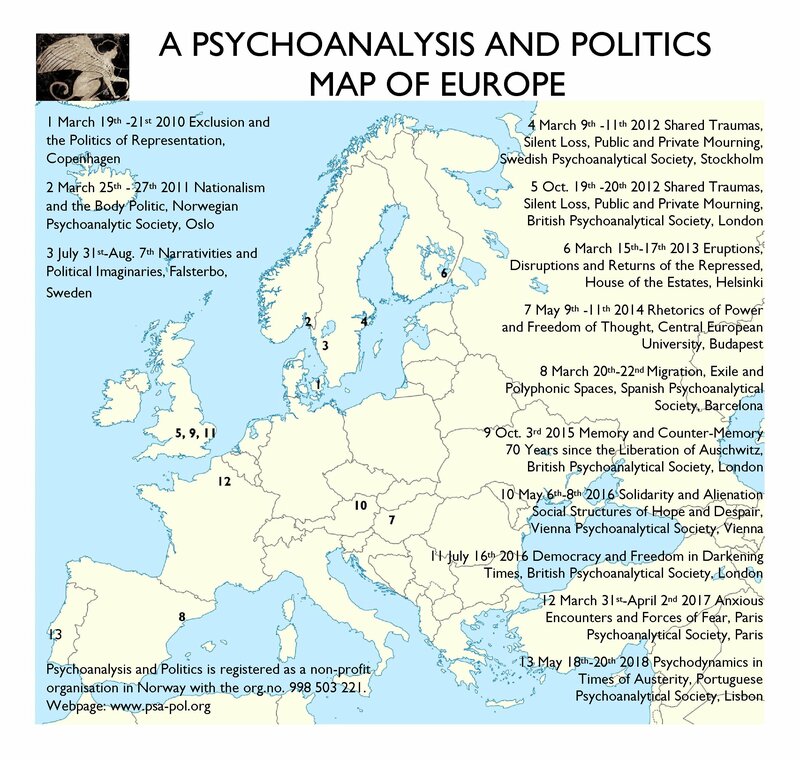 Oct. 19th-20th 2012 Shared Traumas, Silent Loss, Public and Private Mourning The two-day symposium in the British Psychoanalytical Society, London, continued to explore the theme from the Stockholm symposium with the same title. March 15th-17th 2013 Eruptions, Disruptions and Returns of the Repressed Three-day symposium in Helsinki in collaboration with the Finnish Psychoanalytic Society. Recent eruptions of conflict, revolt and discontent have been radical and unexpected. This symposium questions of how to evaluate and to think about these phenomena and to what extent these events challenge the limits of psychoanalytic conceptualisation. July 29th-Aug 6th 2013 Action, A Limit to Psychoanalysis? Ulsteinvik, Norway. May 9th-11th 2014 Rhetorics of Power and Freedom of Thought – Voices of the It and the Over-I, Centre for Advanced Studies, Central European University, Budapest. March 20th-22nd 2015 Migration, Exile and Polyphonic Spaces, The Spanish Psychoanalytical Society, Barcelona. Oct. 3rd 2015 Memory and Counter-Memory – 70 years since the Liberation of Auschwitz, British Psychoanalytical Society, London. 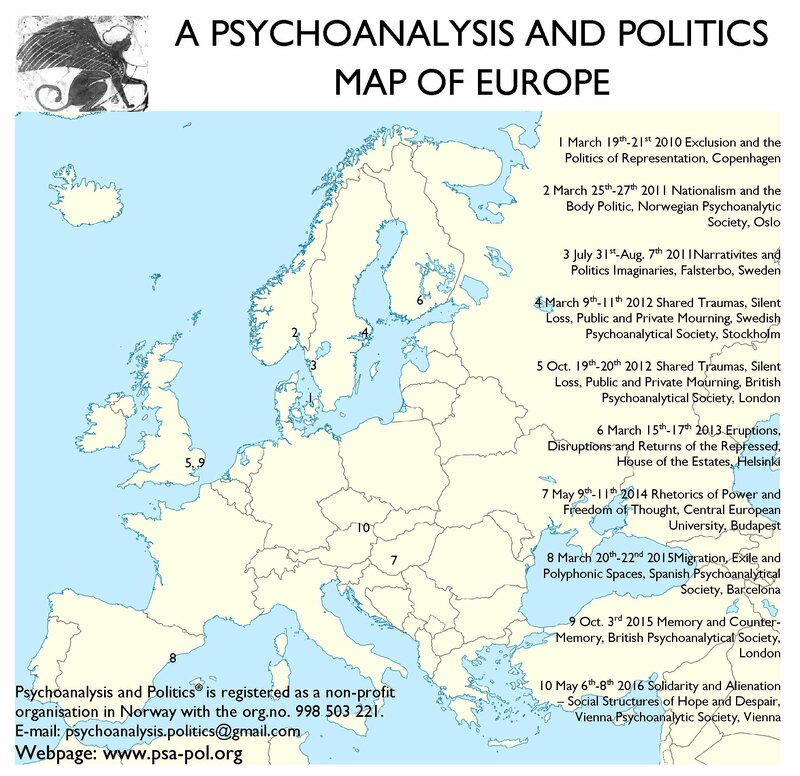 May 6th-8th 2016 Solidarity and Alienation – Social Structures of Hope and Despair, The Vienna Psychoanalytic Society, VPW. March 31st-April 2nd 2017 Anxious Encounters and Forces of Fear, Paris Psychoanalytic Society, SPP. May 18th-20th 2018 Psychodynamics in Times of Austerity, Portuguese Psychoanalytical Society, Lisbon.